Oh, it's gonna be a weird week, isn't it? Episode 12 of the Nosh Show is now available! YAY! Head on over to the The Nosh Show website to listen or download. 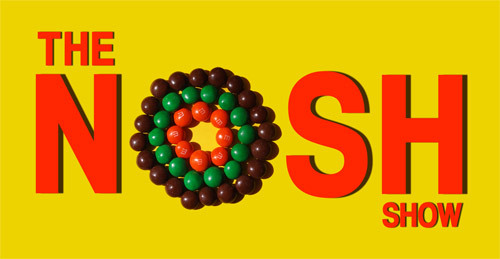 As always, we start with followup (like the Pumpkin Spice M&Ms in the picture above). Next it's Nosh or Not where I expose my never ending lack of foodie sophistication. Then for chew on this it's all about what fall products we are looking forward to, like apple this and pumpkin that. Ironically, since taping the episode, I've heard about a several more new products that I can't wait to try. Apparently I need to do more pre-show research next time! Actually, if you have any fall ideas we missed, feel free to throw them in the comments section and I'll put them on my shopping list. Technical Note: If you are getting the "You have logged out from another location. Do you want to log in again?" when trying to access blogger, it may be because you've disabled third party cookies like I had. Blogger.com now needs google.com cookies to verify your credentials, so you need to allow them if you want to do anything with your blog. That also means Google cookies will work on any site, how convenient for Google tracking! Have listened to the past four or five Nosh Show episodes, and have to say I find the combination of you four to be highly entertaining, lighthearted, and still informative on products overall. I seriously wish you continued success and notoriety on this segment, as I look forward to continuing to partake of them! Thanks! It's a ton of fun to do and I too hope it continues for a long time.